The story of Bushranger Bill, the lovely Tourmaline Lil and mean old Captain Bluff came about after a trip to far western NSW where my dad grew up. A relative showed me a fascinating bower on her property. It belonged to a spotted bower bird who liked to decorate with old bones, stones, bullets and broken cutlery. What a great bad guy! Then my parents found a satin bower bird at their place in the Blue Mountains, who decorated with blue flowers and pegs. He became my hero. 'Bail up!' Which means something like 'Stop right there! I'm going to rob you!' but is quicker to say. 'Bail up' is the title of a famous painting by Tom Roberts. In it, the bushrangers have blocked the road with a tree so the coach has to stop... and then they rob the passengers. 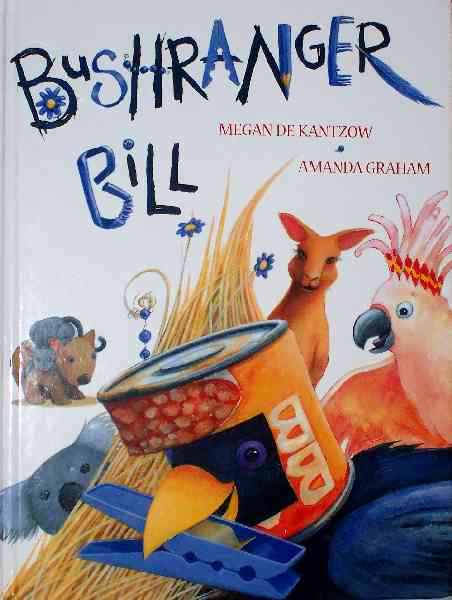 I called the bowerbirds in my story bushrangers because bowerbirds roam the bush and steal things too - treasures to keep in their hideouts. Some bushrangers were just thieves, but people think of other ones like Ned Kelly and Ben Hall as heroes.